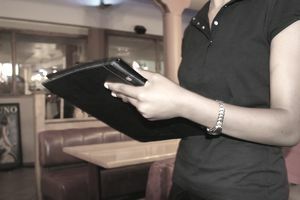 Restaurant promotions offer a way to reach both new and loyal customers, showing your appreciation for their business. Depending on the type of restaurant you operate, some promotions might work better than others. Think creatively and you'll see the variations are endless. The classic restaurant promotion. Offer discount drinks and free appetizers to draw in the after-work crowd on Fridays. If your drinks and appetizers are good, some may stay on for dinner. Others will remember your place weeks later when they're considering where to go for dinner. It's upselling at its best. Everybody loves a bargain, and two dinners for the price of one price is a good one. Obviously, you'll lose your shirt if you serve your most expensive dishes this way, but lower cost entrees using pasta, chicken, inexpensive cuts of beef and certain kinds of fish are good options. They might be so pleased they'll go for dessert or a couple of drinks. Wine tasting dinners are great promotions for slow seasons, like late winter when people are suffering from cabin fever and need an excuse to get out. Your wine distributor can act as a sommelier and help you plan a prix fixe menu with the right pairings of wine. An artisan beer dinner is a good alternative if that's what your customers prefer. Holidays can be very lucrative for restaurants. A prix fixe menu for Valentine’s Day, Mother’s Day and other special occasions is a great promotional event. And, if you take reservations, you can get a full house throughout the evening but avoid an unexpected rush. Live music, open-mic nights, and stand-up comedy have great appeal. If you offer entertainment regularly, you might find the same people returning time and again, even when the mic is turned off. A themed dinner can be hosted on a monthly or annual basis, creating a festive occasion for your customers. You can dovetail a themed dinner with a holiday, such as chocolate-themed dinner for Valentine’s Day. Or create a Caribbean Cruise on a winter's night. Or build a themed menu around the local fare in season. Many community groups partner with restaurants for fundraisers. The restaurant might donate part of the profits to charity. Or the non-profit group might sell tickets that cover the costs plus a percentage for charity. In any case, you'll host some new customers and help a cause. If you have a bar in your restaurant, a trivia night can bring in a good mid-week crowd in between sports seasons. Customers team up, and the winning team gets prizes, such as restaurant gift certificates, t-shirts, or pint glasses. Even if you aren’t a fan of the Superbowl, there are plenty of people who are. Offering dinner specials for the big game in any sport draws customers in when they might otherwise be home with a bag of nacho chips. You might even create a fantasy sports team pool to engage your customers.